Nice and Eze Private Tour Includes: Private transportation to and from the port, English speaking tour guide, taxes, tolls and parking. 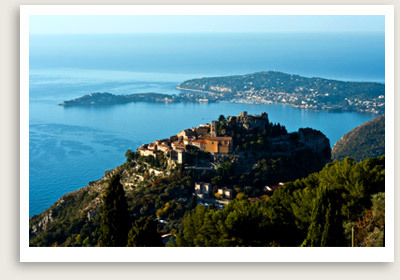 You will start with Eze, a medieval village perched on the hillside. In your Eze private tour, you will enjoy a guided tour of Fragonard, a classic perfumery, and have some time to visit crafts shops. Customize your Eze private tour to include your choice sites and activities. Next you will move on to the elegant and historic city of Nice. You will have free time for lunch and to explore the town. The options here are endless: You can visit Castel Park, overlooking the Bay of Angels, and Old Town, site of the trading center founded by the Greeks 2,700 years ago. Or you may also peruse the art at the Matisse Museum, a short cab ride away, or walk among the olive garden and the 15th century garden of the Franciscan Monastery. Most visitors also stop in for a glimpse of the extraordinary Russian Cathedral; built in 1912, it is the largest and most beautiful outside Russia. One beautiful stroll through Nice is along the Promenade des Anglais, lined with famous landmarks and “Belle Epoque” buildings. A perfect ending to a tour of Nice is a visit to the colorful and fragrant flower market in the Old Town. Here you can try socca, a chickpea crepe that is a Niçoise specialty.